Physical characteristics: The gray-crowned babbler is also called the chatterbox, the happy family, the red-breasted cackler, and the happy jack. It is the largest of the pseudo babblers, measuring 9.5 to 10.5 inches (24 to 27 centimeters) long and weighing 2.2 to 3.2 ounces (65 to 90 grams). This bird has a dull brown body with the characteristic pseudo babbler white markings. It displays a reddish patch on its outer wings when it flies, and its undersides range from dull brown to deep russet brown. It has a brown bill, black feet, and pale cream-colored eyes. The back and center crowns of the head are gray, giving the bird one of its names. Geographic range: The gray-crowned babbler can be found mainly in northern and eastern Australia, and is also located in a small region in southern New Guinea. Habitat: The gray-crowned babbler lives in trees of moderate height and sometimes in shrubs. It prefers eucalyptus, cypress, and paper-bark trees. Since much of its habitat has been cleared for agriculture, this species has been limited to clusters of trees along roadways in their territories. They stay within these narrow bands of trees because they are not strong fliers and are reluctant to fly over open land. Diet: This species eats mainly insects. Behavior and reproduction: The gray-crowned babbler is not afraid of heights. It will forage as far as 66 feet (20 meters) up a tree, turning over leaves and poking into crevices in bark. In drier regions where trees do not grow as tall, this bird will also sift through the litter on the forest floor and even scratch in the dirt, looking for food. Sometimes, it will try to catch flying termites on the wing. This species is rather social, foraging in groups of twelve to fifteen over 25 to 37 acres (10 to 15 hectares) and sleeping together in dormitory nests. Their loud "yahoo yahoo" calls mark territory but also warn of predators and act as a means of staying in touch with all members of the social group. These birds find mates not only in the Australian spring and summer, but also in the fall. 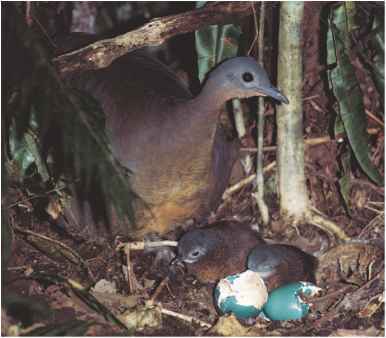 Two to four eggs are laid in huge, messy, dome-shaped nests made from twigs that are built in the forks of branches of shrubs or trees 9.8 to 32.8 feet (3 to 10 meters) high.